In the first decades of the twentieth century, curiosity seekers hit the open road. 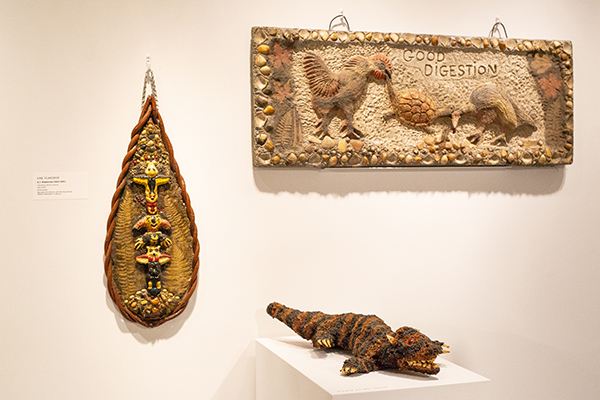 Roadside attractions proliferated along mainstream American highways and backroad byways, touting oddities and curiosities, miniatures and gigantics, relics and totems, and other homegrown marvels. 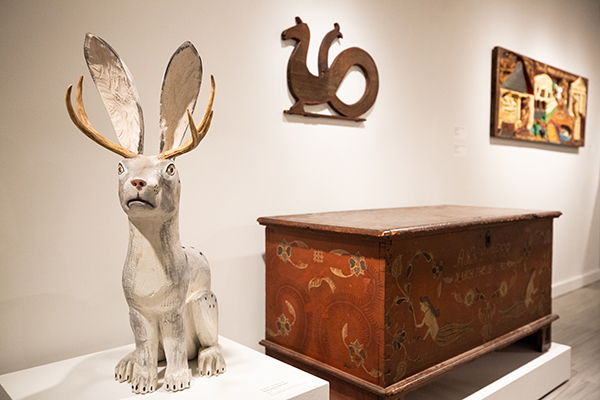 Drawn from the collection of American Folk Art Museum, Roadside Attraction evokes the spirit of this cultural phenomenon—a cabinet of curiosity for the automobile age. 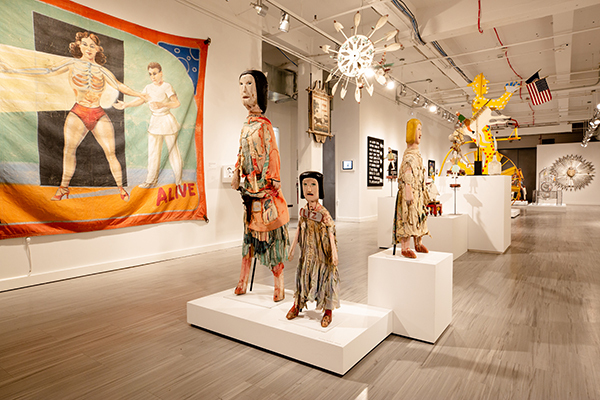 Tradeshow signs, circus banners, and miniatures are exhibited alongside artworks illustrating the paranormal, fantastic, and carnivalesque. 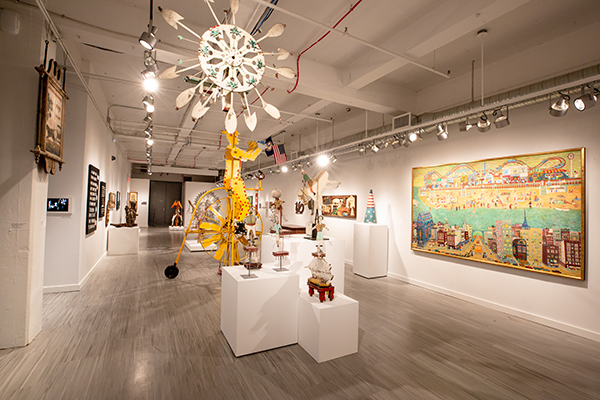 Highlighting works created within artist-built environments, this exhibition examines the relationship between curiosity and entertainment, illuminating the ways they interweave to make space for extraordinary ideas and other worlds. 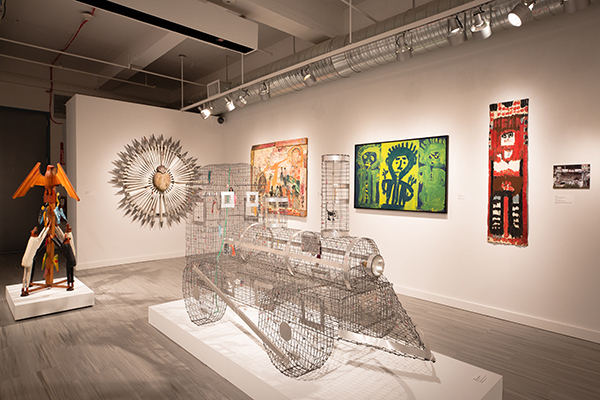 Images: Homecoming in Heaven; Howard Finster; Summerville, Georgia; 1979; paint on plywood with mirrors and lightbulb, in original pyrographed wood frame; 37 × 19 3/4 × 9 5/8 in. 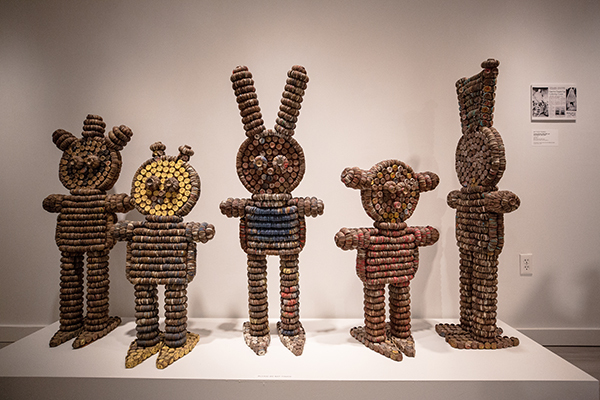 ; gift of the Gitter-Yelen Collection, 2000.26.2. Photo by John Parnell. 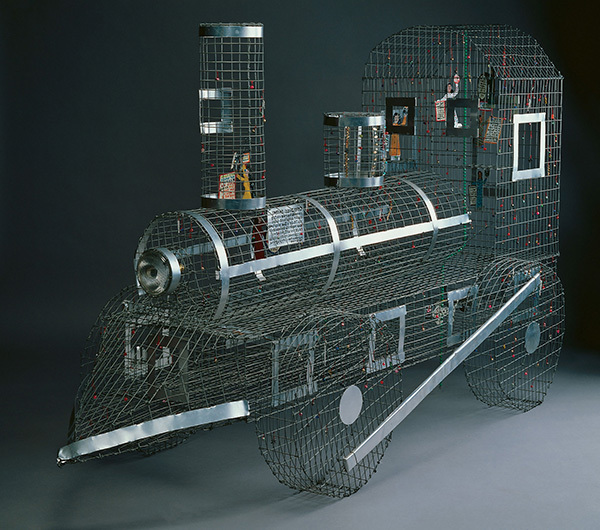 Train; Howard Finster; Summerville, Georgia; 1983; wire, aluminum, headlight and bulb, beads, and found objects; 51 3/4 × 86 3/4 × 33 in. ; gift of Elizabeth Ross Johnson,1985.25.1. Photo by John Parnell. 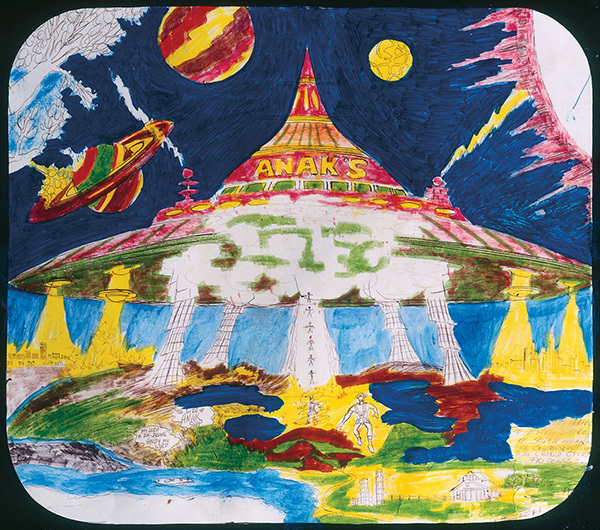 Spaceship; Royal Robertson; Baldwin, Louisiana; c. 1980; mixed media on paper; 24 × 30 1/8 × 3/4 in. ; Blanchard-Hill Collection, gift of M. Anne Hill and Edward V. Blanchard Jr., 1998.10.40. Photo by Gavin Ashworth. 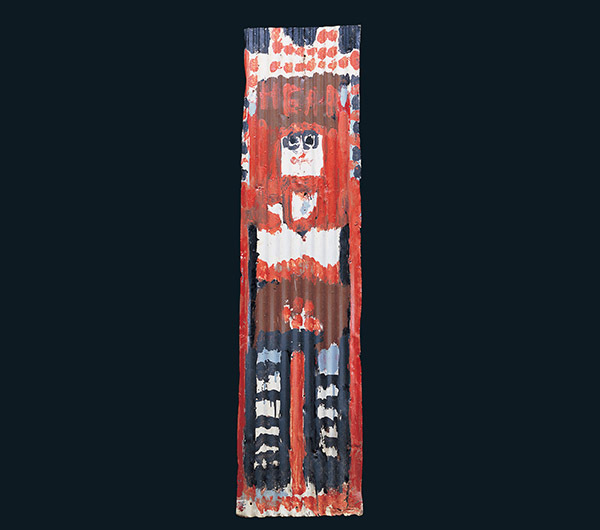 Hear; Mary T. Smith; Hazelhurst, Mississippi; c. 1980; enamel on metal; 54 × 15 in. ; gift of Ruth and Robert Vogele, 1999.4.1. Photo by John Parnell. 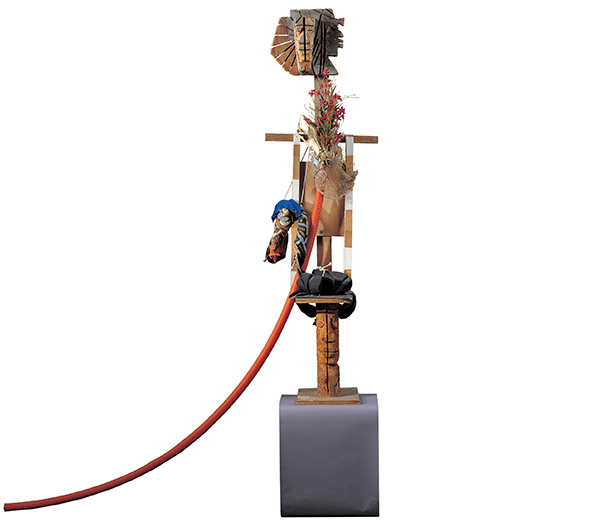 The Ancestor Throne Not Strong Enough for No Rock nor No Crack; Lonnie Holley; Birmingham, Alabama; 1993; paint on wood with plastic tubing, artificial flowers, fabric, cord, animal skull bone, net, and string; 70 1/2 × 66 × 15 in. 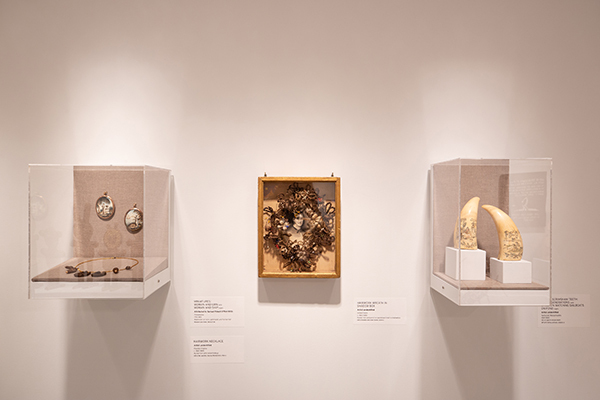 ; gift of Luise Ross, 2000.10.1. Photo by John Parnell. 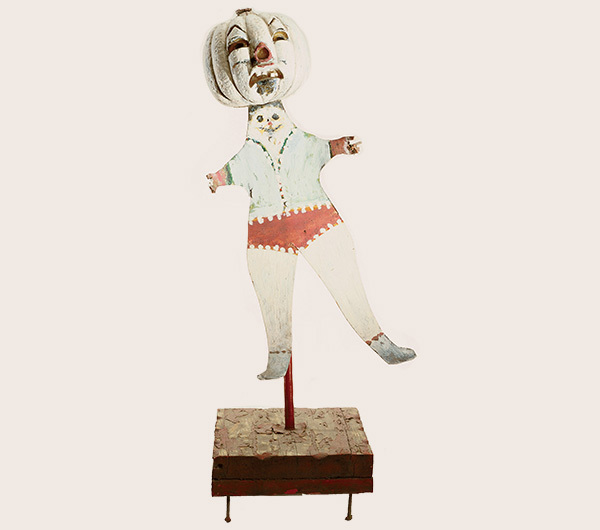 Pumpkin Figure Head; Matteo Radoslovich; West New York, New Jersey; c. 1947–1972; painted plastic, copper, and wood; 26 × 11 × 11 in. 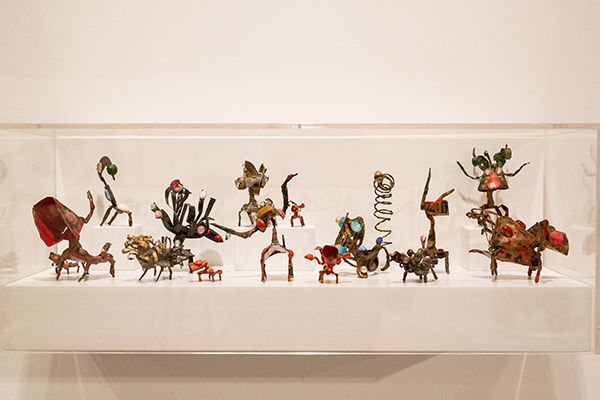 ; gift of Dorothea and Leo Rabkin, 1983.17.18. Photo by John Parnell. 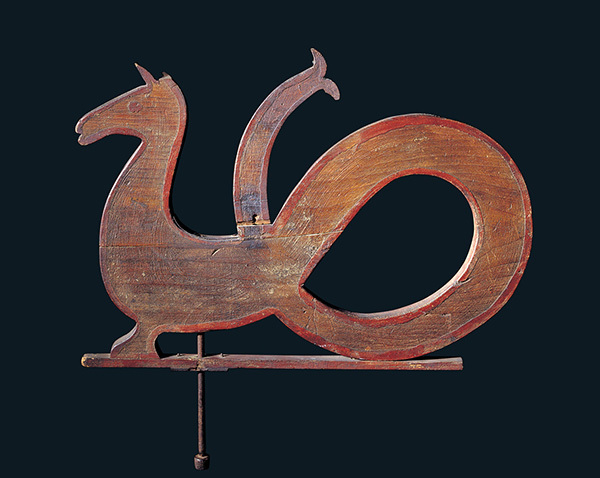 Sea Serpent Weathervane, artist unidentified, New England, c. 1850, paint on wood with iron, 16 1/4 × 23 1/4 × 1 in., museum purchase, 1981.12.13. Photo by John Parnell. 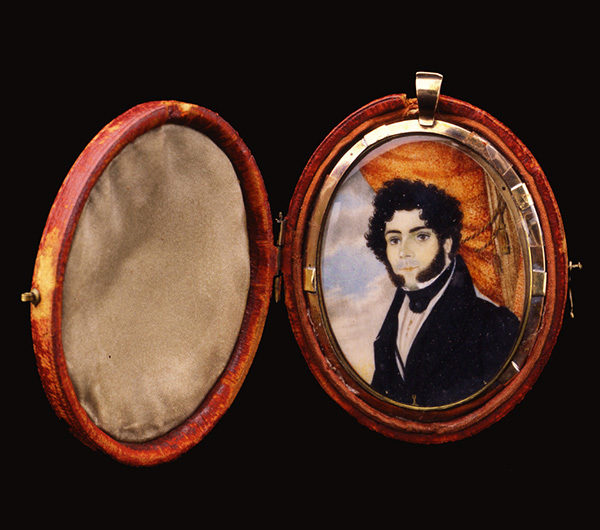 Miniature of a Gentleman; probably Isaac Sheffield; probably New London, Connecticut; 1835–1840; watercolor and metallic gold paint on ivory in metal locket; 3 3/8 × 2 3/8 × 3/16 in. 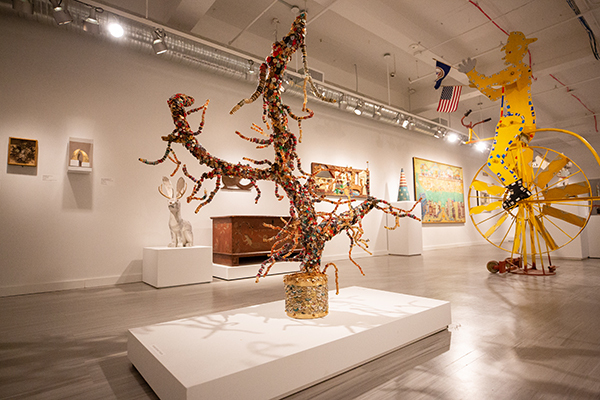 ; museum purchase in honor of Joyce Hill, 1984.16.1. Photo by Gavin Ashworth. 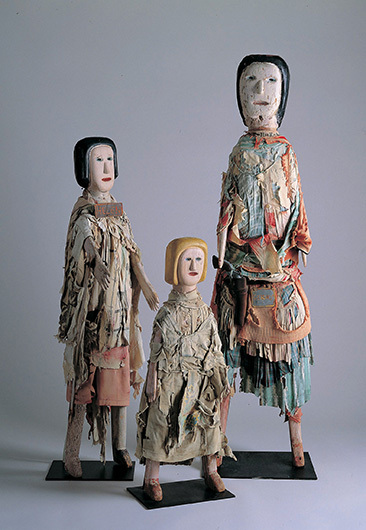 Possum Trot Figures: Helen, Blond Girl, and Genny; Calvin (1903–1972) and Ruby Black (1915–1980); Yermo, San Bernadino County, California; 1953–1969; paint on redwood and pine with fabric and tin; various dimensions; gift of Elizabeth Ross Johnson, 1985.35.3/4/7. Photo by Gavin Ashworth. 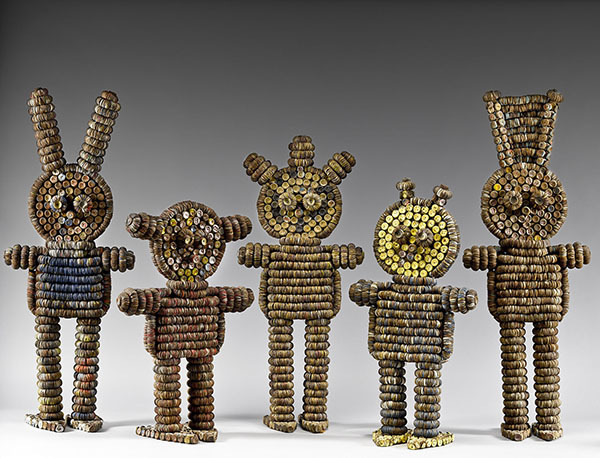 Untitled (bottle cap figures); Clarence (?–1987) and Grace Woolsey (?–1992); vicinity of Lincoln, Iowa; 1950s–1960s; mixed media with bottle caps; various dimensions; gifts of George H. Meyer, 2007.22.1-3, 2008.1.1-2. Photo by Gavin Ashworth. 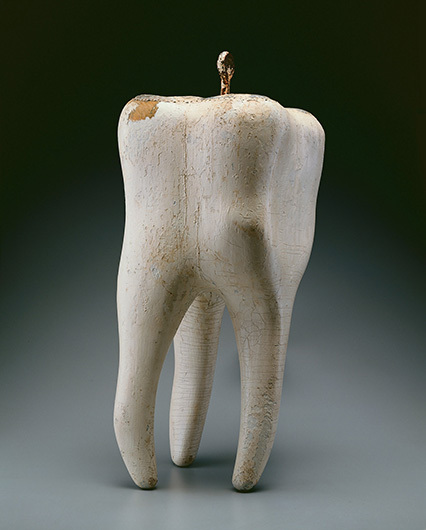 Tooth Trade Sign, artist unidentified, probably New England, c. 1850–1880, paint on wood with metal, 26 × 12 1/4 × 11 1/4 in., gift of Kristina Barbara Johnson, 1983.8.1. Photo by Gavin Ashworth. 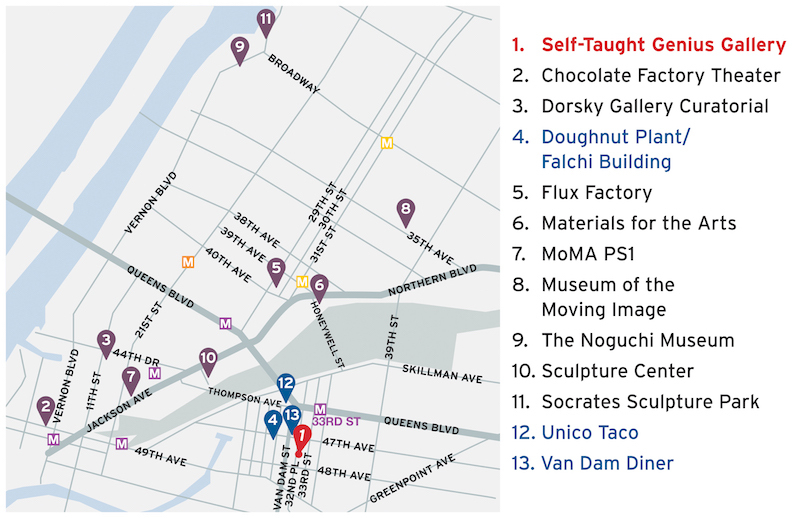 Major support for the Self-Taught Genius Gallery is provided by the Henry Luce Foundation and the Booth Ferris Foundation. 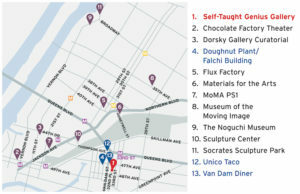 Additional support is provided by the Ford Foundation, public funds from the New York City Department of Cultural Affairs in partnership with the City Council, the New York State Council on the Arts with the support of Governor Andrew M. Cuomo and the New York State Legislature.